This was a steamer with a single-acting, 4-cylinder engine. Cylinders were of 3.25" bore and 4" stroke. Poppet valves were used. The side-entrance tonneau was similar in appearance to the French Serpollet, and was priced at $3,500. This image and description appeared in a 1906 issue of Automobile Trade Journal, page 152 along with many other steam cars. 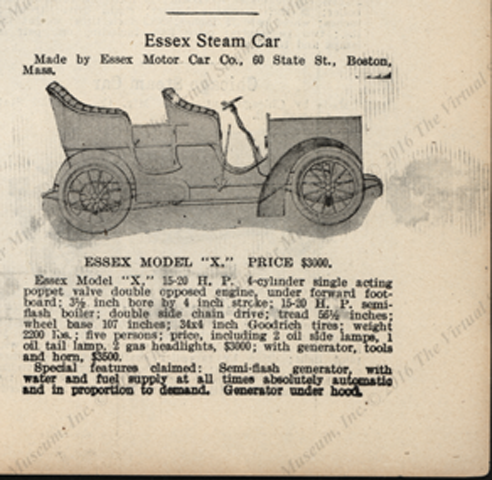 Contact us if you have additional information about the Essex Motor Car Company or if you have questions.